Pump Up Your Book Announces Duane Harden’s 5 Easy Steps to Financial Freedom where YOU can win $10,000 prize! Pump Up Your Book is pleased to announce Duane Harden’s 5 Easy Steps to Financial Freedom Virtual Book Publicity Tour 2012 beginning July 2 and ending on August 24 2012. Duane will be on hand during her nationwide tour talking about his book in candid interviews and guest posts! Lots of fun along the way as Duane stops off at blogs around the world to give her fans a chance to ask him questions about finances and to find out more about his brand new book. As an added bonus, Duane is giving away a $10,000 prize! To find out more details click on banner below or visit his official tour page at http://www.pumpupyourbook.com/2012/06/24/pump-up-your-book-presents-5-easy-steps-to-financial-freedom-virtual-book-publicity-tour-2012-10000-giveaway/. Duane Harden just doesn’t teach you theory but rather you learn through his very own life hands-on experiences that come along with building a strong portfolio of successful businesses, including residential and commercial real estate, a restaurant, a music company, and many more. He began with no financial education, but he was determined and inspired. Today he leads a Cash Flow Club where he mentors entrepreneurs on how to start and grow their business so they, too, can become financially free. His latest book is 5 Easy Steps to Financial Freedom: Do What You Love & Get Rich Doing It. Visit Duane Harden’s website at http://www.ceoebooks.com. If you hate your job and feel stuck in life, and believe that your skills, education, or lack of finances prevent you from taking a chance on something new, then you need to read 5 Easy Steps to Financial Freedom: Do What You Love & Get Rich Doing It by Duane Harden. Conversationally written, and peppered with humorous drawings, helpful worksheets, and key tips, 5 Easy Steps to Financial Freedom: Do What You Love & Get Rich Doing It shows you to do nothing short of changing your life. Harden helps you figure out what your passions are and how to turn them into profitable businesses. When you love what you do, he says, it isn’t work and any business then becomes a real pleasure. Because attitude is everything, Harden demonstrates how to say yes to opportunity, yes to financial freedom and no to the naysayers who would pull you down while trying to elevate themselves (he calls this a crab pot mentality). Practice the Law of Attraction, he advises, by putting up vision boards around you that have photographs of the things you want in your life. If you imagine yourself rich and happy and doing what you love, you attract those things to you. Plus, you are more likely to go out and do the concrete things you need to do to make that life a reality. Harden doesn’t just advise. He practices what he preaches. His 90-day action plan comes from Harden’s own reading, attending seminars, completing home-study courses, and pursuing a variety of his very own life experiences, including purchasing numerous real-estate properties. His “Life Assignments” can help you to begin to think and act differently. His “Keys” point out truths about learning to live a wealthier life style. Rich people are not afraid to take chances, he says, and those chances always pay off. From putting your financial house in order to discovering what really makes you tick, 5 Easy Steps to Financial Freedom will change your life and make you wealthy while doing it. Duane Harden is giving YOU the opportunity to win $10,000 worth of prizes. Click banner below for details! Pump Up Your Book handles all the aspects of virtual book touring from pre-buzzing your book before the tour starts to making sure buyers will find your book long after the tour is over. If you are the author of a newly published book, have an upcoming release or just want to give a previously published book new life, a virtual book tour with Pump Up Your Book is the answer. We welcome traditionally published, electronically published and self-published authors. Our esteem list of clients include Claire Cook, Caridad Pineiro, C.W. Gortner, Barbara Bretton, Cody McFayden, James Hayman, Karen White, Kathleen Willey, Lisa Daily, Lisa Jackson, Mary Burton, Nancy Thayer, Randy Sue Coburn, Ray Comfort, Sandi Kahn Shelton, Sheila Roberts, Therese Fowler, Hope Edelman, Wendy Wax, Jon Meacham, Shobhan Bantwal, Pat Williams, Jane Green, Judge Glenda Hatchett and cook show personality Paula Deen. We also represent Random House, Abingdon Press, Zumaya Publications, WND Books, Sheaf House Publishers, New Hope Publishers, Guardian Angel Publishers, Genesis Press, and Moody Publishing. Contact us to find out what we can do for you and your book! If you’d like to interview Duane or review his book, contact Dorothy Thompson at thewriterslife(at)gmail.com. Pump Up Your Book is an innovative public relations agency specializing in online book promotion for authors. Visit us at www.pumpupyourbook.com. Laura Carroll will be touring July 2 – September 24 2012 with her nonfiction book, The Baby Matrix: Why Freeing Our Minds From Outmoded Thinking About Parenthood & Reproduction Will Create a Better World. We are looking for blog hosts who would like to review this book, interview Laura, have her write a guest post for you or post a book spotlight during her July, August and September tour. This tour is also part of a huge Kindle Fire giveaway where you, the blogger, can win, too! Also we are offering incentives for not only your visitors but you, also. Win $50 for the blog with the most comments and the visitor who leaves the most comments during this tour will also receive $50! To sign up, email Dorothy Thompson at thewriterslife(at)gmail. com with your blog title, blog link, what date would work for you and tell us how you want to host this author (review, interview, guest post or book spotlight). Or you can click here to fill out a convenient form and Dorothy will get back to you within 24 hours. Special Requirement: Your blog must be updated frequently, have more than 60 posts and older than 3 months old. Why does our society hold the belief that we are all destined to have children? Why do we believe that parenthood is the ultimate road to fulfillment in life? In The Baby Matrix: Why Freeing Our Minds From Outmoded Thinking About Parenthood & Reproduction Will Create a Better World, author Laura Carroll answers these questions and more through an exploration of and critical look at the pervasiveness of “pronatalism” – the belief that having children should be the central focus of every adult’s life. Carroll examines the historical origins of pronatalism, the reasons why it has such a deep hold on societies even though most people remain unaware of it, and whether it makes sense – for individuals or for the world as a whole. She shows the ways in which pronatalism is perpetuated, scrutinizes seven major pronatalist assumptions that lead people to accept them without question, and offers alternative mindsets that reflect realities, true reproductive freedom and responsibility in today’s society. Whether you are already a parent, want to be a parent, or don’t want children, you will never think about parenthood in the same way. 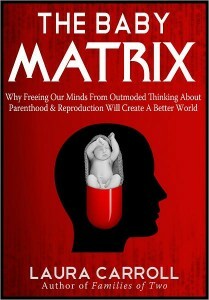 Investigating what few have had the courage to discuss, The Baby Matrix examines the negative effects of pronatalist beliefs, including how they dictate the “normal path” to adulthood, put unwarranted pressure on people to have biological children, and fail to foster a society in which those who are best suited to become parents are the ones who have children. Carroll also brings to light the impact that pronatalism has had on the world at large and will continue to have if its ubiquitous influence is not challenged. Citing compelling statistics, she shows how our belief that we can have as many children as we want is a serious threat in a world with finite resources. In the process, she brings into focus how every life brought into the world directly affects our survival. This manifesto makes the case for why it’s time for all of us to understand why we can no longer afford to leave pronatalist assumptions unquestioned. Without compromise, The Baby Matrix is a reality check for us all. Are we willing to hold on to beliefs that aren’t necessarily true … even to our detriment? This book will make you examine your own intentions and beliefs, will rile you, and might just change your mind. The Baby Matrix is a must-read for anyone interested in psychology, sociology, anthropology, parenting issues, environmentalism, and social justice. But most of all, it’s for anyone, parent or not, who reveres the truth and wants the best for themselves, their families, and our world. You can visit Laura online at www.LauraCarroll.com. Sign up for our FREE book marketing tips!